In its most recent study, Ceresana analyzes the world market for styrene-butadiene rubber (E-SBR and S-SBR). Per year, more than 5.1 million tonnes of these types of rubbers are consumed worldwide. More than half of global demand is generated in the region Asia-Pacific. The study deals with data for the years starting in 2009 and forecasts data until 2025. All information on demand, production, import and export for the period are indicated in tonnes – the revenues in the currencies US dollar and Euro. Elastomers have been necessary for several technical applications but also for various everyday objects in the past decades. Styrene-butadiene rubber is a copolymer consisting of the chemicals butadiene and styrene, which Ceresana has already analyzed in separate market studies. SBR is produced by emulsion polymerization (E-SBR) or by solution polymerization (S-SBR). Styrene-butadiene latex, which is used for example as coating in the paper and textile industries, is not considered in this study. E-SBR is accounting for about 72% of total demand for SBR. The smaller S-SBR market, however, is accounting for much more dynamic growth rates of 3.8% per year. In this report, the use of SBR in the segments tires, industrial and construction products as well as other areas of applications is analyzed. The most important sales market in 2017 was the segment tires: More than 67% of total worldwide demand was generated by tires and replacement tires. 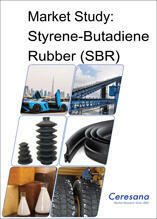 Tires are mainly made of SBR, BR and natural rubber. E-SBR is mostly used for standard tires. In contrast, S-SBR is needed to manufacture tires with high abrasion resistance and low rolling friction. The manufacture of industrial products is the second largest application area worldwide, consuming about 740,000 tonnes. SBR is required for a wide range of products in the individual industries from the chemical industry, mechanical engineering, the automotive industry (except for the tire sector, which is considered individually) to the electrical and electronics industry. Rubbers are used in, e.g., conveyor belts, roll coverings, consumer goods, hoses, profiles, gaskets, cables, adhesives, molded parts, and plastic modification. In the construction industry, SBR is used for the production of, for example, pipes and pipe gaskets, cables, roofing films, profiles as well as for the modification of other building materials. From 2017 to 2025, Ceresana expects global demand in the segment construction industry to increase by 2.0% per year. Chapter 1 provides a description and analysis of the global SBR market, including forecasts up to 2025: The development of revenues, demand volumes, and production is analyzed for each region of the world. Chapter 2 offers a detailed analysis of 23 countries: Demand, export, import, production, capacities, and revenues in regard to SBR. Additionally, demand split by applications is examined in regard to these countries. Market data on demand are split by the types S-SBR and E-SBR for each country. Chapter 3 analyzes the different types of application areas of SBR in detail: Data and influencing factors on the use in tires, industrial products (conveyor belts, roll coverings, consumer goods, tubes, adhesives, moldings, etc. ), construction products (pipes & pipe gaskets, cables, roofing films, profiles), as well as other application areas (leisure and sports products, protective clothing, soles, gloves, and textiles). Chapter 4 examines the demand for SBR in the regions Western Europe, Eastern Europe, North and South America, Asia-Pacific, the Middle East, and Africa – split by the styrene-butadiene types E-SBR and S-SBR. Chapter 5 offers a useful directory of the 41 most important producers, clearly arranged according to contact details, revenues, profit, product range, production sites, profile summary, and information on capacities. The most important manufacturers include: Arlanxeo Holding B.V., Goodyear Tire & Rubber Company, JSR Corporation , Korea Kumho Petrochemical Co., Ltd., PetroChina Company Ltd., Sinopec Corp., Synthos S.A., TSRC Corporation, Trinseo S.A., and Versalis Corporation.